Discussion in 'Multi-Extrusion' started by mhackney, Mar 6, 2014. I finally decided to stop procrastinating and get 'craken with my Kraken! I'm doing this in steps. 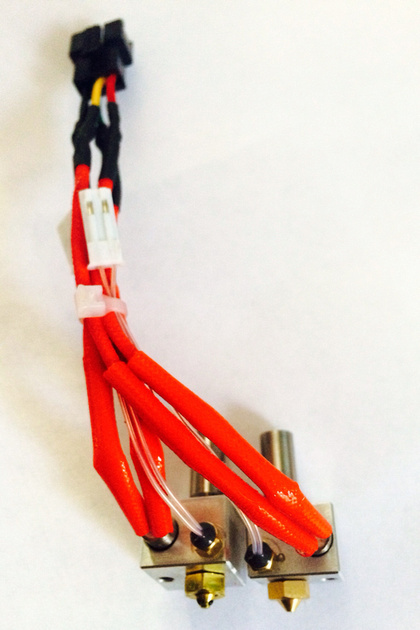 Step 1 - get Kraken installed and working with 1 hot end/extrurder. Step 2 - wire second extruder and hot end. 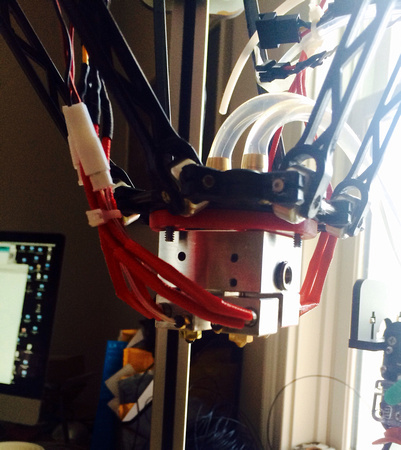 Step 3 - swap RAMBo electronics for my new Azteeg X3 Pro which can handle 5 extruders and hot ends out of the box! Step 4 - install extruder/hot ends 3 and 4. The journey has begun with step 1! Good luck with getting it all up and running! You will find out soon that there was no need to procrastinate - its much easier than one may imagine, despite it looking a little intimidating. You may be interested in a Blog post Sanjay and I wrote about our experience of getting it running - http://e3d-online.com/index.php?route=e ... blog_id=20 there is a bit in there about getting the nozzles level. The post is centered around using The Kraken to print "unprintable" objects using breakaway support material. We actually just received an Azteeg X3 PRO from Roy and will be hooking our Kraken up to it some time later this month, but it sounds like you will beat us to it, so any lessons you learn would be gladly received. Looking forward to hearing more.. Thanks Josh. I agree, the Kraken is not intimidating, I just have a ton of other stuff on my plate. I want to get cracken as quickly as possible so I'm pushing forward. I'll keep this thread updated with my progress. Very good job in getting your Kraken up and running. These wires will then collect at the Bowden tubes and be routed up with them. I am waiting for some red spiral wire wrap to hold everything together. The silicone water cooling tubes require a backbone to keep them from collapsing. I will probably route them up one of the Bowden tubes too. Lots of plumbing and wiring on a Kraken! install the X3. I found a package of 100 of the jumpers for a good price and purchased those, I'll have a few spares! At risk of sounding like a noob (i am to bowden at least), what are people using for extruders to the Kraken? I have a printer with direct feed, and i really want a Kraken, but i cant seem to find any extruders. Any suggestions? A bowden geared extruder - http://www.thingiverse.com/thing:60531 is the one we are going to use on the Deltas. the one you feel would best fit your printer. Awesome, I wasnt sure if there were any available for purchase or if you just print one and attach it to a stepper motor. Thank you. What kind of printer are you going to put the Kraken on? Well i just ordered a RigidBot printer to try it out on. I know the controller included will support at least two hot ends/extruders, but i'm awaiting a response to see if it can do more. If not, i'll just run dual from the Kraken until i decide to upgrade the controller. I am not familiar with the RidgidBot but you certainly sound as though you have a handle on what to do. Best of luck getting it up and running! Much appreciated. Its a new printer that is modular allowing you to increase the build volume with simple hardware increases ie: Rods and belts.